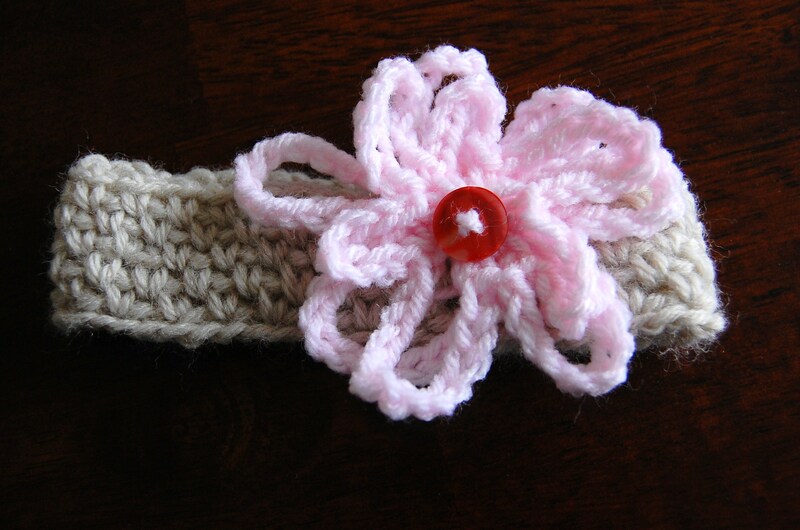 The first project made from my big crochet idea is this sweet little girl’s headband. It’s very simple and a basic pattern for anyone to make for a newborn in their life. Instead of tackling a bigger project like a newborn’s dress, I instead designed a headband. Maria, I’ll be mailing this out to you next week . Congratulations on the upcoming birth of your daughter… I hope she enjoys her new headband! 45 yards Worsted Weight yarn. I used Lionbrand Wool-Ease Worsted Weight in “Natural Heather” and some extra pink yarn. Rounds 3 – 5: ch 2, *sc in ch-1 space, ch 1*. Repeat around (25 scs, 24 ch-1 sts). Round 1: chain 9 (counts as first sc + ch 8). Ch 12, sc into ring. *Ch 8, sc, Ch 12* Repeat around until you have 5 loops/ petals (3, ch-8 loops, 2 ch-12 loops). Join to first sc with sl st. Round 2: Working in back sc of previous round, sc. *ch 13, sc in next sc*. Repeat around until you have 5, ch-13 loops/ petals. 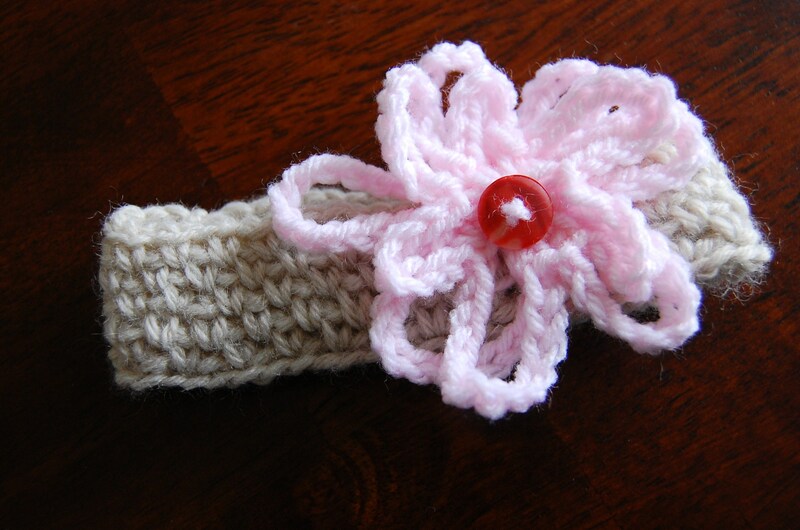 Fasten off, leaving a long tail of yarn to sew flower onto headband. 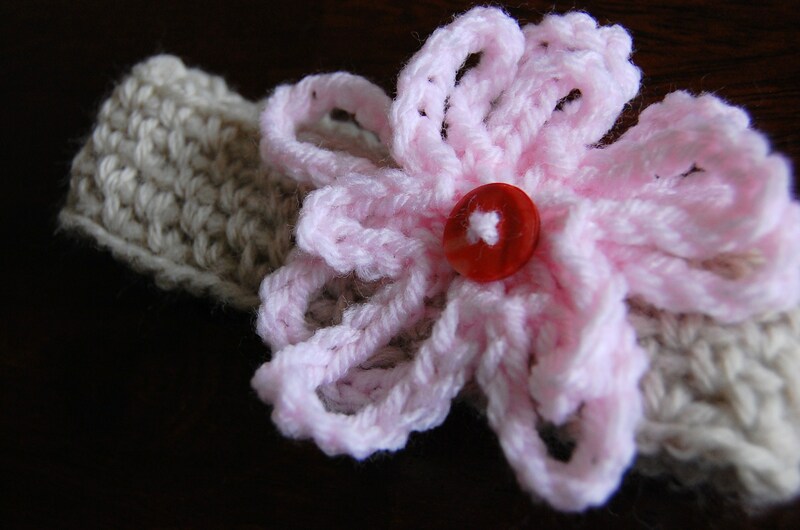 Sew flower onto left side of headband (button center optional). Thank you so much Jayna. You definitely made my day. Usually I’m the one who does all the crocheting, i’ve never had someone crochet something for me.. You are the best. thanks again. What a pretty headband, I love the open chain flower motif. Heather. Thanks for the pattern…I love it!! I am 5 months pregnant and I will have a baby girl in Spring. I am looking for someone can sell or make like this headband for my daughter.